THIS ARTICLE WAS WRITTEN BY MANSI KHURANA, A STUDENT OF VIVEKANANDA INSTITUTE OF PROFESSIONAL STUDIES. Reverse charge mechanism (RCM) is not a new concept. It is a mechanism in which the recipient of the goods or services is liable to pay tax in contrast with the normal taxation regime in which the liability of paying tax is on the supplier of the goods or services to the government by collecting the same from the buyer of goods or the receiver of the services. Suppose, A is the seller/service provider and B is the buyer/service receiver. So, in normal taxation regime A will collect the tax from the buyer/service receiver and will pay to the government. But in case of reverse charge mechanism the burden will be shifted from the supplier/seller to the buyer or the service recipient. Thus, under the normal taxation regime the liability is on the supplier to collect the tax and pay the same to the government after adjusting output tax liability with the input tax liability. Under RCM, the liability is on the buyer/receiver to pay tax in specified cases such as imports and services or the goods notified by the government. Aggregate turnover excludes the value of inward supplies on which tax is payable by a person on RCM. Distinction between RCM under earlier regime and RCM under GST: Under the earlier regime, the RCM was applicable in service tax for services like Goods transport agency, Insurance Agent etc. But in GST, the RCM is applicable on both Goods and Services unlike earlier regime in which the RCM was applicable only on the services. Also, in service tax, there was the concept of partial reverse charge but there is no such concept in GST and the recipient has to pay 100% tax on the supplies made under GST. Under GST regime, Rent a cab services, manpower services and works contract services are not covered under the RCM. 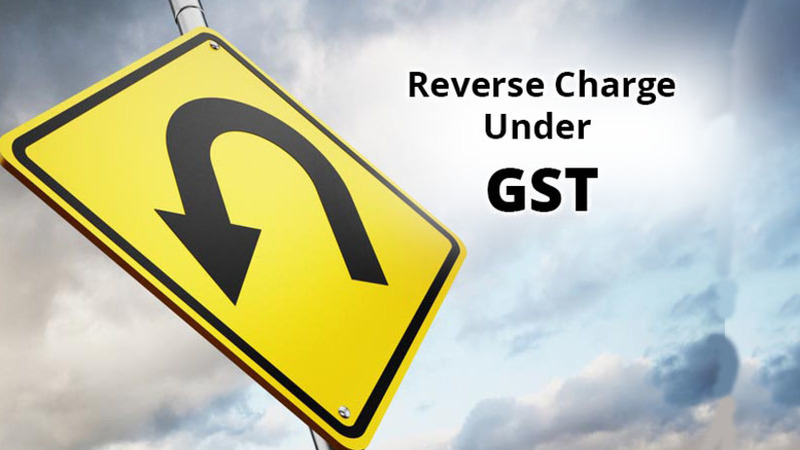 As per Section 2(98) of the Central Goods and Service Tax Act, 2017 (CGST Act), “the reverse charge means the liability to pay tax by the recipient of the supply of the goods or services or both instead of the supplier of such goods or services or both under sub-section (3) or sub-section (4) of section 9 of Central Goods and Services Tax Act, or under sub-section (3) or sub-section (4) of section 5 of the Integrated Goods and Services Tax Act.” RCM is not applicable in the case of exempted supplies. On the basis of the nature of the supply or the nature of supplier: This scenario is reflected by the section 9(3) of the CGST Act and Section 5(3) of the Integrated goods and service tax Act, 2017 (IGST Act). As per these sections, the Government on the recommendations of the council may notify the categories of supplies of goods or services on which the tax shall be paid under RCM by the Recipient of the supplies of goods or services or both. Where the supplies by the unregistered person to a registered person: This scenario is covered under Section 9(4) of the CGST Act and section 5(4) of the IGST Act. As per these sections, the tax is paid by the registered person whenever he procures supplies from the supplier who is unregistered person. So, the registered person who is receiving supplies form an unregistered supplier is liable to pay tax under RCM. In case where the aggregate supplies received by the registered person in a day from any or all the unregistered suppliers is less than Rupees 5000, then those supplies are exempted. If value exceeds Rs.5000, for example Rs.8000 in a single day then GST is payable on the value of Rs. 8000. In case of Inter-state Supplies, even if the value of taxable supplies is less than Rs.5000, full GST Payable by registered person. No exemption of Rs.5000. Till 31.03.2018 all the categories of registered person are exempted from the applicability of RCM provisions under Section 9(4) of the CGST Act and Section 5(4) of the IGST Act. It must be kept in mind that this exemption is applicable only till 31.03.2018. Also, section 9(4) of the CGST Act is not applicable on the TDS deductor. Hence, the persons mentioned in section 51 of the CGST Act need not to pay the tax under RCM in case of supplies from unregistered person. In case of supplies by the E-commerce operator: As per section 9(5) of the CGST Act, in case of intra state supplies, if the supplies are made by the e-commerce operator then the RCM will be applicable and he will be liable to pay GST. For example, Urban Clap provides various services like beauticians, plumbers etc. So, the Urban Clap is liable to pay GST after collecting the same from the consumers rather than the registered persons who are providing the actual services. Further provided that if there is no physical presence of the e-commerce operator in the taxable territory of India then the representative of the e-commerce operator will be liable to pay GST. But if there is no representative of the e-commerce operator in the taxable territory of India then he will have to appoint someone as representative who will be liable for paying GST. Requirement of Registration under RCM: A person who is liable to pay tax under RCM has to compulsorily registered under section 24 of the CGST Act and the threshold limit of Rupees 20 Lakh will not be applicable and Rupees 10 Lakh in the case of special category states. The persons who are only engaged in making supplies of taxable goods or services or both, the total tax on which is liable to be paid on reverse charge basis by the recipient of such goods or services or both under section 9(3) of CGST Act as the category of persons exempted from obtaining registration. Input tax credit (ITC): A supplier of the Goods or Services or both cannot avail ITC of the GST paid on supplies by the Recipient under RCM. However, the recipient can avail the credit only on the condition that those supplies are used or will be used for business purposes. The date immediately following 30 days from the date of issue of invoice or similar other document. The date immediately following 60 days from the date of issue of the invoice or similar other document. Whenever it is not possible to determine time of supply using the above said methods, the time of supply would be the date of entry in the books of accounts of the recipient. As per section 31 of CGST Act, Rule 46, 50, 51 of CGST Rules, 2017, every tax invoice, receipt voucher and refund voucher has to mention whether the tax is payable on reverse charge or not. Every registered have to maintain books of accounts for the supplies on which the tax is payable on reverse charge. The input tax credit cannot be used in discharging reverse charge mechanism liability. However, the recipient can claim credit after paying under reverse charge if he is eligible. Table 4 of GSTR-1 is to be furnished by filling details of supplies attracting RCM. GST is also leviable on the advance paid for the supplies attracting RCM. 1 GST services Goods Transport Agency (GTA) Any factory, society, cooperative society, registered person, body corporate, partnership firm, casual taxable person; located in the taxable territory. 2 Legal services by advocate. An individual advocate including a senior advocate or firm of advocates. Any business entity located in the taxable territory. 3 Services supplied by an arbitral tribunal to a business entity. An arbitral tribunal. Any business entity located in the taxable territory. 4 Services provided by way of sponsorship to any body corporate or partnership firm. Any person Any body corporate or partnership firm located in the taxable territory. (iii) transport of goods or passengers. Central Government, State Government, Union territory or local authority Any business entity located in the taxable territory. 6 Services supplied by a director of a company or a body corporate to the said company or the body corporate. A director of a company or a body corporate The company or a body corporate located in the taxable territory. 7 Services supplied by an insurance agent to any person carrying on insurance business. An insurance agent Any person carrying on insurance business, located in the taxable territory. 8 Services supplied by a recovery agent to a banking company or a financial institution or a nonbanking financial company. A recovery agent A banking company or a financial institution or a non-banking financial company, located in the taxable territory. 9 Supply of services by an author, music composer, photographer, artist or the like by way of transfer or permitting the use or enjoyment of a copyright covered under clause (a) of sub-section (1) of section 13 of the Copyright Act, 1957 relating to original literary, dramatic, musical or artistic works to a publisher, Music company, producer or the like. Author or music composer, photographer, artist, or the like Publisher, music company, producer or the like, located in the taxable territory. 10 Supply of services by the members of Overseeing Committee to Reserve Bank of India Members of Overseeing Committee constituted by the Reserve Bank of India Reserve Bank of India. 5 Supply of lottery. State Government, Union Territory or any local authority Lottery distributor or selling agent. Explanation.- For the purposes of this entry, lottery distributor or selling agent has the same meaning as assigned to it in clause (c) of Rule 2 of the Lotteries (Regulation) Rules, 2010, made under the provisions of sub section 1 of section 11 of the Lotteries (Regulations) Act, 1998 (17 of 1998). FREQUENTLY ASKED QUESTION COVERED UNDER THE RCM? What would be done on tax paid on advance receipt if advance has to be refunded in any circumstance? you could reply or recognize my suggestions to make this site more content focused .